It is from me. Sorry for it being a bit late. Hope that makes up for it! Ok today was the original deadline for gifts. I have edited the original post to reflect to who have received gifts. According to my calculations there are 3 of us still waiting. Garslag, DocNuk and myself. I have seen BigMek Gobsmasha posting on here are about, hopefully he/you get it sorted out. I will give those other gitz who are delayed until the end of the week to give a their recipient a situation report on the gifts status. After that the public shaming will commence. a lot of fantastic bits. allready after a short look i see 3 - 4 interesting things to do with it. it looks like it is from garr. Perth's just up the road from me. Shouldn't be long now! Oh, and there woz a box of dice, so now I have to go play some Kill Team or I'll look ungrateful. Anyway, well worth waiting for, cheers mate. PS - didn't paint the base edges 'coz I couldn't figure out what brown you'd used - seemed a better bet to leave them for you to paint so that they match up proppa. SuperYay - I tried to match the paint to your Collectors as best I could but English mid-winter light as opposed to Aussie spring light. I'm really glad that you mentioned this, as my first thought when i saw them was to use them to bulk out Da Kollectorz. 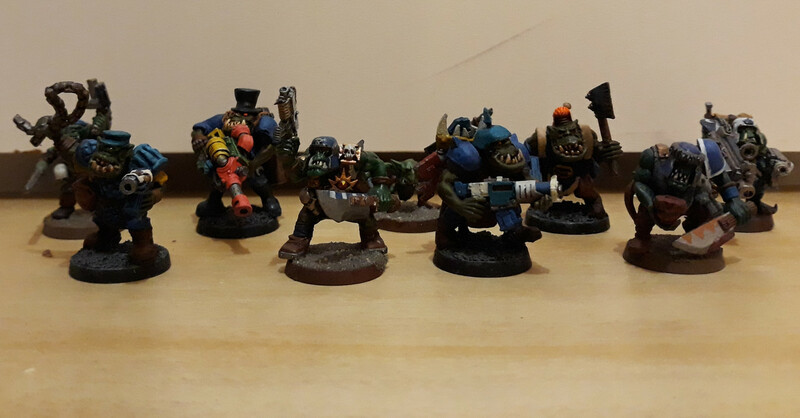 Your painting style is quite different to mine, but I'm comfortable with that - I've mentioned before that orks to me should be a mismatched rabble if at all possible. I have some jewellery chain laying around, and also some plastic stuff from a chaos LR. You won't be offended if I help Chainy expand his collection? I think you've given me the kick in the arse I needed to do a little more work on this project. I'll take a photo of all the painted Kollectorz together, tomorrow or Friday probably. That lascannon - I've had one of those since forever in one of my earliest Evil Sunz shoota boyz units. I never knew what it was meant to be and i always counted it as a big shoota. Whoops. Anyway, it was the spanner hanging from his belt that put me in mind of the SAG mek. You've done a bang-up job of fitting him in with the modern ladz. Boney sticks out like dog's balls (again - mismatched rabble), where this guy could pass for a regular boy at first glance. Are any of them named? The most noticeable difference is that the new guys have browner skin - perfect. I always try to mix skin tones within a unit. I've found that rather difficult to achieve with the new Citadel range, so you've done me a favour there. I need one of the LGSs to start stocking Vallejo or something. Also noticed that the bases haven't been painted, and the brown that's on them currently is my usual Mournfang Brown undercoat. Probably was planning to DFO that last. I really like the guy with the shoota and about three different blues on him. You probably noticed I was trying to mix the blues up in the unit. Lighting could be better, i took this photo at like 1am last night while going a few rounds with sudden onset insomnia. (Could be worse too, i could have turned off all the lights and took photos in the dark) I'll do better next time, and hopefully include some newly painted wunz. I have a strong urge to call the top hat guy Slash.